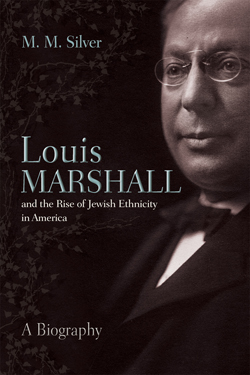 Syracuse University Press will launch its newly published biography, “Louis Marshall and the Rise of Jewish Ethnicity in America,” at a book talk and signing with author M.M. Silver on Wednesday. March 13, at 5:30 p.m. at the Onondaga Historical Association, 321 Montgomery St. in Syracuse. The launch is one of several events planned this year to commemorate the 70th anniversary of SU Press. The event is free and open to the public; books will be available for purchase. Syracuse native Louis B. Marshall (1856-1929) was one of the most important figures in the Jewish community in the 20th Century, and he had a significant impact both in Syracuse and nationally. A prominent corporate, constitutional and civil rights attorney, he reportedly argued more cases before the U.S. Supreme Court than any other attorney of his era. He was a tireless advocate for a number of notable American Jewish organizations and institutions, and spearheaded many civil rights campaigns for other ethnic groups. He was a driving force in establishing the New York State College of Forestry at Syracuse University—now the State University of New York College of Environmental Science and Forestry (SUNY-ESF). He was a SU trustee and the first president of the Forestry College Board of Trustees. In 2006, the 100 block of the popular Marshall Street on the Syracuse University hill was renamed Louis Marshall Way in his honor. Silver will travel from Israel to attend the book launch. He is a modern Jewish history scholar at Max Stern College of Emek Yezreel in Israel and the author of several books and articles, including “Our Exodus: Leon Uris and the Americanization of Israel’s Founding Story” (Wayne State University Press, 2010). For more information on the event, call 428-1864.